Designed to actively lift up dirt and grime for faster, more complete cleaning, microfibre cloths have a huge range of advantages. Unlike traditional cleaning products, which require the addition of both chemicals and water to effectively remove dirt, grease and grime, microfibre cloths work effectively to clean up spills with water alone. Microfibre cloths work effectively to clean up spills with water alone, unlike traditional cleaning products, which require the addition of chemicals to the water. Below, we’ve explained how microfibre cloths work, as well as the key advantages of using microfibre for your cleaning needs. 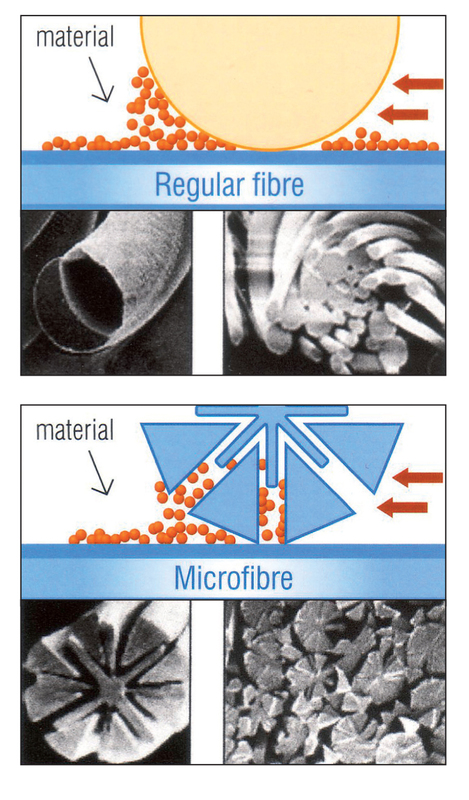 Microfibre is a high-tech, synthetic fibre material. Smaller than cotton and other conventional fibres used in cleaning cloths, towels and standard cleaning items, microfibre has a diameter of just 0.13 denier and less than 1/100 the diameter of human hair. Most microfibres are made from materials such as nylon and polyester, although a variety of materials are used in microfibre production. From durability to ease of use, microfibre offers numerous advantages over other materials commonly used in professional cleaning equipment. Thanks to the asterisk-like shape of microfibres, microfibre cloths can have more than 40 times the total surface area of conventional fabric cleaning cloths. This means that a microfiber cloth is significantly more capable of trapping dust, dirt and other particles than a similar-sized cloth made of cotton or other material. From a usage perspective, this means faster, more efficient and easier cleaning without the need for extra cleaning cloths. Not only are microfibre cloths more capable of trapping dirt and dust than conventional fabrics – they’re also easier to use. The combination of microfibre filaments and static allow microfibre cloths to effortlessly pick up excess dirt, dust and liquid. On moist surfaces, microfibre cloths can also provide more efficient cleaning than conventional fabrics thanks to the capillary action of the moisture. This all adds up to ease of use that’s unmatched by other materials, making microfibre cloths ideal for busy kitchens, washroom and other environments. With care, microfibre cloths and mops can last for 200 to 500 washes, making them significantly more durable than cotton and other commonly used fabrics. Microfibre also dries faster than cotton and other materials, reducing the risk of bacteria growing on the fibres of the cleaning cloth in between washes. Finally, microfibre cloths are positively charged, meaning they naturally attract dirt, grease and other negatively charged substances. This lets you clean efficiently and effectively without the need for excessive amounts of chemicals. Microfibre also allows you to clean with a fraction of the water usually required. Because microfibre cloths are highly efficient at trapping dust and dirt, only a small amount of moisture is required to wipe down most countertops, tables, floors and other surfaces. Disclaimer: The information provided through Greenham Pulse is for general guidance only and is not legal advice. Greenham Pulse is not a substitute for Health and Safety consultancy. You should seek independent advice about any legal matter.